Bitcoin and the mainstream media is reality. Yesterday CNBC had Bitcoin news on every show in every hour. Fox Business News followed suit. Bloomberg boarded the Bitcoin train a long time ago too. Even The New York Times is taking notice. Let’s not leave out Forbes, Fortune, Business Insider among others. The business world is abuzz with Bitcoin as it should be. Bitcoin is beyond the scope of a good investment strategy and it’s way beyond a bubble. The percentage gain and the fortunes made couldn’t be ignored from Mars. The guy that bought pizza with Bitcoin some years ago (present day value placing that pizza with a cost of millions of dollars) makes Bitcoin and the mainstream media coverage that has ensued entirely understandable. The media always loves a good story as any good PR professional will tell you. And as stories go Bitcoin is a Cinderella tale with Scrooge McDuck elements. Early adopters of Bitcoin are very rich people today assuming they are still holding Bitcoin. At the current pace of Bitcoin pricing these visionaries will be billionaires in the near future. For people like me that got on the bus later, there is still a lot of money to be made. And all of these possibilities revolve around the stratospheric rise of Bitcoin value on an almost daily basis. As investments go, investment advice out there now encourages people to invest in Bitcoin even IF it’s a bubble. Despite all of the energy and attention surrounding Bitcoin I feel that the best is yet to come in terms of Bitcoin and the mainstream media. There will be coverage of several rags-to-riches stories, more coverage of individuals and families who are sacrificing short-term comfort (like selling your home and all of your belongings to buy cryptocoin as you live in the wild) for long term gain. No one should doubt that Bitcoin’s star is only rising and the mainstream media is paying very close attention. 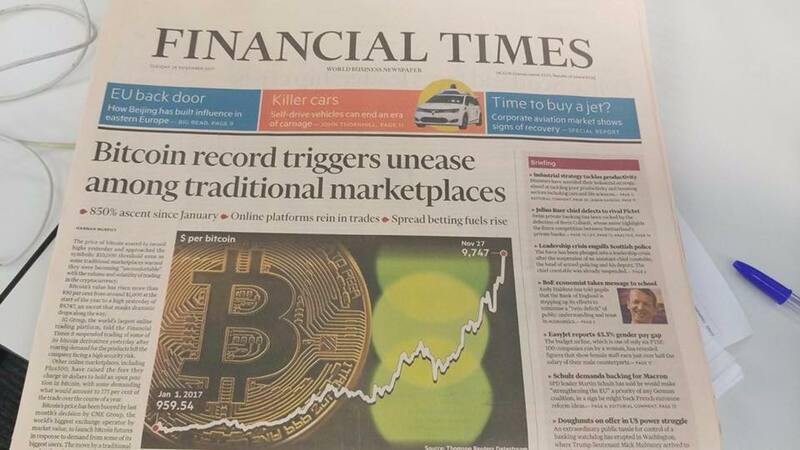 The love affair between bitcoin and the mainstream media has only started.